On Tuesday, TechVancouver held their inaugural meetup at the Unbounce office in Vancouver with nearly 150 people in attendance. TechVancouver brings together tech leaders, innovators, and enthusiasts with the intention of creative education, networking, and advancing the city’s technology ecosystem. After drinks and mingling, the event opened the “community mic,” which allowed anyone in the audience to take 5 to 10 seconds to present themselves or their company to get exposure and facilitate later conversation. The event featured five-minute, TED talk-like presentations from selected local technology leaders. Last night, Kevin Sandhu of Grow, Andrew McLeod from RentMoola, Kimberly Hansen from signl.fm, Spencer Thompson from Sokanu, and Jayesh Parmar from Picatic each had five minutes to impart their wisdom before being cut off. Organized by Alexander Norman, TechVancouver is a counterpart to TechToronto, which was created to strengthen the tech community in the city. Norman claims the turnout in Vancouver tripled that of the first event in Toronto. He claims in five years, the digital experience will change, though in what way is anyone’s guess. The spirit of change though, he claimed, will be one of increased convenience, transparency, and flexibility as exemplified by Uber, Airbnb, and Netflix in their respective domains. Kimberly Hansen from signl.fm spoke of lessons in branding, with funny anecdotes on choosing a name. For instance, you do not want a business name that autocorrects to ‘vomiter’. Spencer Thompson from Sokanu discussed the question: “Why does your company exist?” If you want to build the best company or career for yourself, Thomspson claims, it needs to be aligned with and optimized according to one of five reasons for being. Thompson has categorized these reasons as 1) to make as much money as possible, 2) to solve a personal problem, 3) to solve a market need, 4) to solve a social issue, and 5) to utilize personal abilities. Finally, Jayesh Parmar from Picatic, a company that just surpassed $10 million in sales, presented a captivating talk on ‘dogfooding’, or using your own product, taking the audience through Picatic’s meandering and fascinating journey from Saskatoon through San Francisco, Toronto, New York, and finally Vancouver, and discussing the highlights and advantages of each. 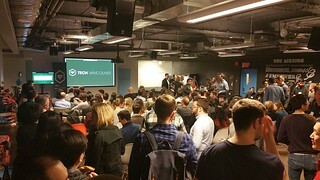 The next TechVancouver meet up will be on March 29 and posted on meetup.com.